The programming language wars will always continue. In the meantime, though, as someone who likes the python language, I’m pleased to see the uptake at universities around the U.S. (and, as noted in the HN thread, by other universities around the world, too). This entry was posted in Programming, Python and tagged Python on July 11, 2014 by Dan York. If you are a Github user and also interested in building SMS apps, please feel free to “watch” that repo and follow along with my own experiments. Code will probably be a mixture of python and Node.js, with occasional other languages thrown in. This entry was posted in Node.js, Programming, Python, SMS, Voxeo and tagged Node.js, Python, SMSified on May 20, 2011 by Dan York. In the process of writing about the site that lets you run Linux in your web browser, I learned about Skulpt.org that is essentially the same idea only for a python command line. 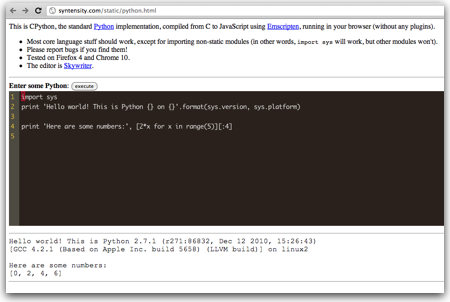 The demo at www.skulpt.org is pretty cool… just modify the python code in the screen and press Ctrl+Enter to execute the code and have the output appear in the box below. To play with it yourself, you can get the code at http://code.google.com/p/skulpt/ or as author Scott Graham shows on the Skulpt.org page you can just use mercurial to clone the repo. I haven’t installed it myself… again, like the “Linux in your browser” experiment, I think this is very cool but I’m not entirely sure where I’d personally ever use. Still, I’m very glad people build projects like this – if for no other reason than showing that this could be done! Today Voxeo launched SMSified a new service that lets you use a really simple RESTful API to send text messages within the US for only 1 cent per message. I and other colleagues have been writing about SMSified on the SMSified blog and after writing a tutorial about using SMSified with curl, I figured I’d play around with python a bit and code up an example of sending a SMS via python. As you can see in the code, there are really only three lines of importance: the one building “apiurl”; the one urlencoding the data; and the one opening the URL. The rest are really just for the convenience of using variables. The final line simply prints out the info included in the result JSON. I was going to (and still may) make that print out prettier or say something more… and if you are reading this sometime in the future, the version on Github may have already morphed and evolved into something different. The point is that now that you get JSON back, you can parse it and start to take action on it. Anyway, this was just a quick sample app to experiment with SMSified. If you have checked out the new service, it’s free to set up a developer account and currently is free entirely during the beta period. In full disclosure, Voxeo is my employer. This entry was posted in Python, SMS, Tools, Voxeo and tagged Python, SMS, SMSified on May 17, 2011 by Dan York. Now you just do a HTTP POST to that URL and… ta da… the results of your post appear on the new webpage. It’s a very cool way to debug webhooks! P.S. Obviously there is no language limitation here. I happened to use python because that was what I was debugging, but you can use PostBin with ANY language that is sending HTTP connections. This entry was posted in Programming, Python and tagged debugging, Python on February 4, 2011 by Dan York. You just type in some python code and press the “Execute” button. Now, sure, it doesn’t have support for much outside the very core language… and you could get all of that by simply flipping to a terminal window and using python from the command line. Still, it’s a fun way to be able to show people new to python what they can do… and a cool proof-of-concept of running python directly inside your web browser! This entry was posted in Python and tagged Python on January 26, 2011 by Dan York. Python heading up O’Reilly’s recent book promotion? …  while Python has a large following in data science. It’s particularly interesting, and important, that using Python to collect data from sensors (“Real World Instrumentation with Python”) made it onto the list. 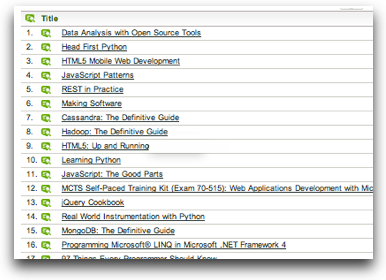 This entry was posted in Books, Programming, Python and tagged Books, Python on December 1, 2010  by Dan York. This server has received 5725489 hits from both ipv4 and ipv6.